Quiet birthday celebrations are usually unheard of among the cream of Nigerian society. It comes as no surprise then that the richest woman in Africa, Mrs. Folorunso Alakija pulled all the stops to ensure her birthday was celebrated with as much fanfare as possible. Not only that, the indefatigable Society Lady, tripled the joy on this occasion with the celebration of her 40 years in marriage and the launch of her inspirational books on the same day. The philanthropist and owner of Rose of Sharon foundation, appeared many years younger than her age, a glaring evidence that she is not only a successful woman in the world of business but also a successful home maker. A devout Christian, she ensured that before anything else, God tooks centre stage as the celebration kicked off with a church service at the Cathedral Church of Christ, Marina, Lagos where family and friends from different parts of the world gathered to thank God for her life. The order of Holy Communion and thanksgiving were done with the usual doctrines of the Anglican Church while melodious hymn were rendered by the church choir. Many people testified to her wonderful attributes which were worthy of emulation and prayed for her continued success. The Alakijas spent time dancing and praising God in the course of the event. Rose of Sharon Glorious Ministry International Choir provided extra-special songs that also gladdened the hearts.of the congregation. After the church service, guests made their way to The Ballroom, Lagos Oriental Hotel, Victoria Island for a grand reception. From the entrance to the interior of the hall everything was magnificent. Life size portraits of the beautiful 65 year old celebrant were spotted at strategic corners of the venue. Everywhere was sparkling with a touch of crystal gold; the glass chandeliers, the accessories on the chairs and tables were all beautifully laid out by Victoria F events. It was a thorough display of finesse expected of a multi-billionaire of her class. Guests in resplendent and exquisite outfits occupied almost all the seats, the venue was packed full, an evidence of the love and respect that the Alakija family commands. The comperes, Koffi and Helen Paul really did a good job as guests were not bored for a second. It was no doubt fun and laughter all through. The birthday girl, being the cynosure of all eyes, beamed gorgeously with smiles in her amazing dress made by Lanre da Silva-Ajayi while a documentary on her success story was played on the giant screens. The businesswoman, who had announced at several occasions that she is a lover of fashion, wore two stunning outfits in the course of the celebration. Guests were thoroughly entertained by Faith Band. They trilled till very late into the night. 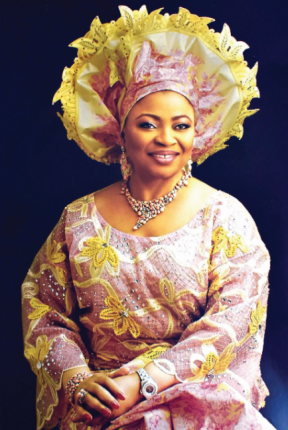 Mrs. Alakija started her career in 1974 as an Executive Secretary at Sijuade Enterprises, Lagos, Nigeria. She made her mark in the fashion industry as the President of Fashion and Designers Association of Nigeria, FADAN. Her label, Rose of Sharon metamorphosed into Rose of Sharon Prints and Promotions; then Digital Reality. To show that the celebrant’s philanthropic exploit was no fluke. Some guests went home with lot of gifts after playing a creative game which was all her idea. Guests were treated with sumptuous list of meals by Abilar Catering, all one needed to do was to place an order from the menu placed on every table, and bang, you had it. As guests were having a good time in the venue, the celebrant launched her inspirational books, which was reviewed by Pastor Shola Adesoye. She presented six wonderful and amazing books in wonderful colours. Some of the titles are; ‘Folorunso Alakija Speaks’, which contains her words; ‘His name is’ which reveals the different names of God in different languages, and then there were ‘Wish for it? ‘Pray for it’ and many others. Her husband, children, grandchildren and special guests joined the unveiling as the books were presented to the world. The event also saw many forms of entertainment. There were thrilling performances by the Soloist, Ms. Elsie Otto. The impressive performance of Oyinbo Jesu got everyone amazed based on the fact that she is a white woman who sings basically Yoruba gospel songs. After the cutting of the cakes, members of Rose of Sharon Foundation which enjoy the full sponsorship of the Alakija family took centre stage to thrill guests. The party was top-notch as Captains of Industry, big wigs, political elites, and more were spotted everywhere. They included Senate President’s wife, Mrs. Toyin Saraki, Sen. Florence Ita-Giwa, former Cross Rivers State governor, Donald Duke and wife, Onari, wife of Lagos State Governor, Mrs. Bolanle Ambode, Hon. Abike Dabiri-Erewa, wife of former Lagos State Governor, Dame Abimbola Fashola, Imo State Governor’s wife, Mrs. Nneoma Nkechi Rochas Okorocha and many others.